If you go back, dont go back to the good times, but go back to your roots! Nobody turns nobs and smokes beatz like the one they call Drum Cypha. This is the evidence. World exclusive next to Digitals label Function, we are proud to announce the mans 2nd release on SRBE. 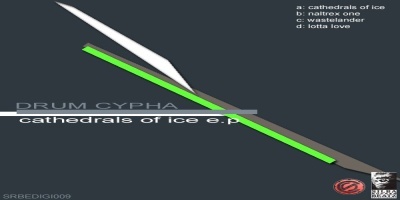 Bouncin of this 4 track EP Cathedrals Of Ice passes thru with the original jungle Drum and Bass vibes we love since day one. Mental spheres over a chopped up amenbreak, cypha-style. Rollin out with a simple, monotone bassline. Big, bad n’ heavy. Naltrex One keeps the monotone but bad rollin vibe, while Wastelander is a guranteed rewind on any Floor, no matter which genre. Wicked selected and set piano-string. Universal technic. To keep our style of settin surprises for all lovers of Chill-Out Hip Hop Downtempo Beatz, Lotta Love gives you what you need. A guranteed heavy rotator in your musicbox. These tunes are being played by DJs like Digital, Bailey, B-key, Equinox and A-sides, amongst others.